I’ve previously posted on how I am conceptualizing cartoon ideas and how the concepts came about. 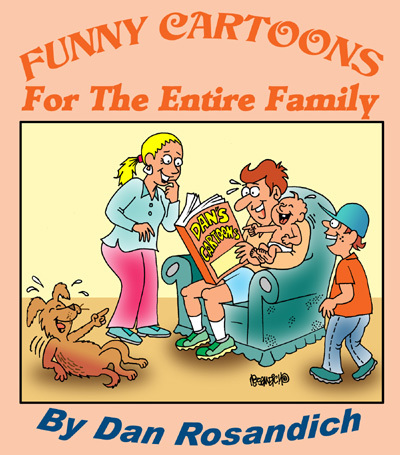 I am stumbling across randon cartoons and offering feedback on what struck me with the idea or concept on how a certain cartoon scenario came to me. One in particular is timely enough since it involves various multiple subjects. These kinds of cartoon ideas seem to have a deeper impact and are remembered better by those who’ve seen the cartoon. 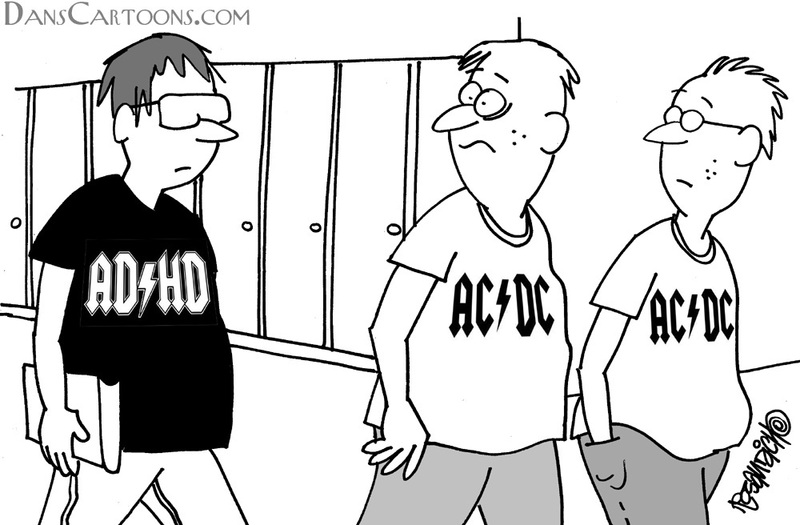 One in particular is my “AC/DC” cartoon I’m sharing here. It pertains to various elements such as education, music and the subject of “attention deficit disorder”. Something very prevalent in today’s educational system. All of these factors, not to mention it’s a captionless cartoon. One of my favorite types of gag panel cartoons to create, since it speaks for itself and is self-explanatory. Here is a brief synopsis as to how one of my recent cartoon ideas came about. I was listening to some AC/DC and deleting some junk emails. If you hate them as much as I do, you literally take very little time looking at the subject line and quickly highlight and then delete it. As I was scrolling through, and with Brian Johnson belting out one of their usual “best of” hits, a subject line in one of the emails read simply “ADHD”….as we all know, means ‘attention deficit hyperactivity disorder‘. 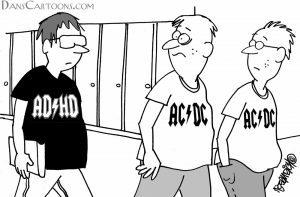 And I thought it to be the perfect cartoon that resulted here: Three school students walking with t-shirts….two have shirts that read AC/DC and the other one reads ADHD (made his shirt all black….to attract the eye). The trick was to show both t-shirts resembling one another with the same font. It’s always difficult to describe an actual creative thought process because our paths in thinking may differ. However, by keeping an open mind and trying to absorb your surroundings, you’ll remain more perceptive. Sometimes it’s much better than forcing your ideas to come along.